Astronaut Pierre Thuot is at the ready, waiting to grab the Intelsat VI. 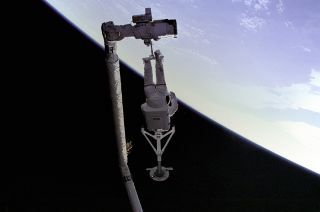 In this historic photo from the U.S. space agency, STS-49 Mission Specialist Pierre Thuot is perched on the end effector of the Robot Arm (Remote Manipulator System/RMS), with the Intelsat VI capture bar on May 13, 1992. This would be one of many attempts to "grapple" the Intelsat VI satellite which was rendered inoperative when its Payload Assist Module (PAM) motor failed to fire thus preventing it from reaching an operational altitude.